Brady Scott grew up in the Northern California city of Petaluma, whose Main Street and architecture look so traditionally American it's been used for movies such as "Peggy Sue Got Married" and "American Graffiti" -- and Ronald Reagan's "Morning in America" campaign commercial. Born in 1999, Scott, like so many kids in the USA, started playing recreational soccer at age 6 -- and he also played basketball and tennis. But what happened on a wet weekend when he was a U-9 would set him on a unique path for an American kid. A Friday downpour left big mud puddles on the fields at a NorCal play date in Manteca, California. None of the young players seemed inclined to stand in the swamp guarding the goal -- besides Scott, who started enjoying the mud as soon as he arrived. "Partly because of the excitement, Brady had decided to take a ball through one of these big mud puddles and probably ended up face-first in the drink," said Brady's father, Shannon Scott. "Brady had a fairly competitive edge to him early on and I think he realized that goalkeeper was a key position -- and he stepped up and volunteered at the first play date to play in goal." He would become one of the USA's most highly touted young goalkeepers. When he turned 18, in June 2017, Brady Scott signed with German Bundesliga club FC Koeln. Going pro in Europe was something Brady started thinking about when he was in his early teens. The ambition required a great amount of commitment from him and his family -- and ultimately led to making the difficult decision of turning down a soccer scholarship at one of the nation's top universities. While playing for the Sonoma County Alliance, Brady Scott got invited to NorCal/U.S. Club Soccer's PDP identification program and was referred to Hugo Perez, who then served as the region's U.S. Soccer Technical Advisor. Perez, also then serving as U.S. U-15 coach, invited Scott to the first of many youth national team camps. From the Sonoma County Alliance, Scott moved to Marin FC, and then to the De Anza Force, where he was coached by Shaun Tsakiris, soon to become the USA's U-16 national team coach, and Eric Yamamoto, who has also served as U.S. Soccer goalkeeper coach and is associate head coach at Santa Clara University, where he was goalkeeper on the Broncos' NCAA Division I title-winning team in 1989. "Brady eating dinner in the car on the way down, preparing a snack to eat on the way home, and also doing homework in the car, and getting home at 11:00, 11:30 p.m."
By then, Brady Scott had started specializing in goalkeeper. Through his play at Marin FC, he played half the time as a striker. "At the time, me and his mom, who aren't soccer people, were asking the coaches, why don't you play him the whole game in goal?" said Shannon. "As we later learned, he was developing his feet on the field, that field play benefited a goalkeeper's development." With U.S. youth national teams, Scott traveled to nations including Slovakia, Sweden, England, Spain, Serbia, Czech Republic, Mexico, the Netherlands and South Korea. In 2016, Scott won the Golden Glove when the U.S. U-18s, under Coach Omid Namazi, won the Vaclav Jezek Tournament in the Czech Republic. He had also been called up by Coach Brad Friedel for the U.S. U-19s' trip to Spain, and was a 17-year-old reserve goalkeeper for Coach Tab Ramos' team at the 2017 U-20 World Cup. Scott is also eligible for the 2019 U-20 World Cup. Brady's mother, Teri, graduated from UC Berkeley. His father, Shannon, from Pepperdine University. His older sister, Riley, is a junior -- and all-America swimmer -- at USC. Brady had a scholarship offer from the University of Virginia, which boasts not just a national power soccer program but is ranked among the most prestigious colleges in the USA, coming in at No. 3 among public universities, according to U.S. News & World Report. When Brady was 14, Sonoma County Alliance director Andrew Ziemer set up training for him at Dutch club Vitesse. "He had exposure to what was happening in Europe and that kind of set him on a path to want to maybe someday go there," said Shannon. "When he was showing that kind of desire and drive, we started planning for possible options to help support that dream as a family. "As a family, we value travel and we've been fortunate to be able to share with our children Europe on a few different occasions. Brady had been to Europe through our initiative and had multiple opportunities to be exposed to soccer in Europe and culture in Europe through his travels with U.S. Soccer and a few of the trials he went on." Riley, Shannon, Teri and Brady Scott. Teri had perspective on what Brady's experience would be like if he chose to go pro in Europe. After starring for Cal's volleyball team, she moved to Paris to play for Racing Club. "She's kind of been through what Brady's been going through," Shannon said. "Except she was four years older." Shannon and Terri were impressed with how meticulously Brady researched his options. "He actually consulted with non-soccer people about the academic side of life," said Shannon. "As a family, mom and dad were very supportive of the option to go to Europe. It was ultimately his decision, but he knew mom and dad were supportive either way." For his part, Brady figured he could continue his education while being a professional athlete. Now in Cologne, he's got soccer six days a week. Weekday practices include double-days on Tuesday and Thursday. One day each week, there's strength training as a team, and twice a week Brady does strength training on his own. Games are usually on Saturdays. He's finishing up his high school studies through a correspondence course and then plans to work toward an undergraduate degree with online courses. He also has one-on-one German courses, and studies the language on his own. "I did research on how to get my education outside of soccer while still becoming a pro," he said. "I realized that no matter what path I chose, I would get an education. I didn't want to lose this opportunity, and I decided to take the chance and do what I really wanted to do, which was to become a pro." After his first six months, Brady says he's settled in. And on the soccer field, he's getting what he'd hoped for. Brady Scott is the latest U.S. U-20 goalkeeper to go pro in Europe. Jonathan Klinsmann, the starter for the USA at the 2017 U-20 World Cup, moved to Hertha Berlin last summer, although Klinsmann, two years older than Scott, spent two seasons at Cal. Zack Steffen, reserve goalkeeper at the 2013 U-20 World and starter at the 2015 U-20 World Cup, moved to Germany's Freiburg after playing his second season (2014) at the University of Maryland. Steffen returned to the USA in 2016, was the Columbus Crew's starting keeper last season, and made his full national team debut last month. The USA's 2013 U-20 World Cup goalkeeper Cody Cropper left his home state of Minnesota, skipping college, and spent six years in England before in 2016 joining the New England Revolution, for which he started last season. Scott, like Klinsmann, plays for his Bundesliga club's reserve team in the Regionalliga, the fourth division. Regionalliga clubs that are the reserve teams of First or Second Division teams are basically U-23 teams. Regulations restrict the number of older players they're allowed to field, while the Bundesliga clubs use their Regionalliga teams to develop young players -- and to give first-team players, such as those recovering from injury, game action. Teenagers like Scott and his teammates, mostly in their early 20s, face off against men always eager to show off against a Bundesliga club's farm team, not mention they're aiming for promotion to the Third Division. "It's like we're the young underdogs," Scott says. "The games are very competitive. ... It's been an adjustment going from U-18 [Development] Academy to playing fourth division in Germany. It's a much faster and stronger game, playing against men, so it's definitely more challenging -- but it's what I was looking for to get better." Shortly after Scott arrived in Germany, he got invited to preseason camp with the first team in Kitzbühel, Austria. "It was beautiful there and great to be so quickly in with the first team," Scott said. "It was obviously the best level I ever played at. It's very fast, physical, competitive. A great opportunity for me to improve my speed of play, and dealing with stronger guys. That was a super positive experience." In August, he got his first of four starts for FC Koeln II in a 2-0 fourth division win at Rot-Weiss Essen in front of a crowd of 6,777. 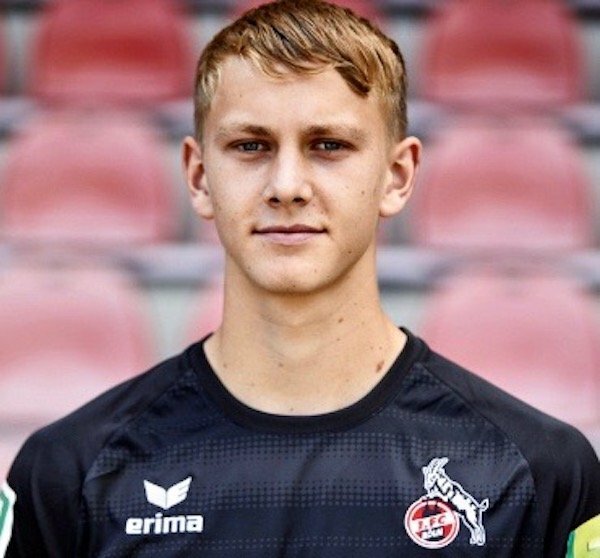 Scott, the youngest of the four goalkeepers in the FC Koeln II squad, has also played a couple times for Koeln's U-19s, but he trains full-time with Koeln II. Sven Mueller, a 22-year-old who is the first team's third-string goalkeeper, gets most the playing time in goal for Koeln II, but Scott started Koeln's penultimate game before the winter a break, a 2-1 loss to SC Wiedenbrueck, after which Coach Andre Pawlak said, "Brady Scott's good saves prevented a bigger defeat." Koeln II returns to Regionalliga play on Feb. 17 against FC Wegberg-Beeck. Scott's off-field adjustment has been going well. "Overall, everyone's been very friendly and supportive," he said. "The staff as well. A great club. Great group of people. The first-team players are also very nice to the younger players." Teri moved to Germany to lend support. She lives 20 minutes away, and teaches and coaches at a British boarding school, and they meet weekly for dinner. Scott misses his California friends, but: "I already have a couple of new friends who I'll be friends with the rest of my life." And although he craves Californian Mexican food, he has acquired new tastes: "Dark bread, a little bit of butter, and slab of Leberwurst -- it's the best." 3 comments about "To go pro or play college ball: How U.S. teen goalkeeper Brady Scott opted for the German route". Wooden Ships, February 5, 2018 at 9:53 a.m.
Enjoyable read. Got me to thinking, once again, with more overseas-Mexico too and domestic academies offering playing/developing opportunities, US colleges need to become a two semester sport. Or, risk becoming less relevant. So many reasons why this should happen and none, that I can think of against. I coached at the university level 11 years and I knew it was really a terminal soccer experience. This applies to women as well, notice lately how most other countries have caught up to us. Ric Fonseca replied, February 6, 2018 at 10:20 p.m. I know only too well that of which WS speaks (Mr. Ships, which/what university and when???) having also worked/coached at the university and community college levels, intermitengly from 1968 - 1982, and 1989 - 2003, starting out first at Cal St Univ East Bay (then CSU Hayward) and then after 1970 and also the youth level Santa Monica UTD, North Hollywood Jets of the CYSA-S in the Los Angeles area. So the concept/idea that the Scholastic State Federations, NCAA, NAIA, NJCAA and other like-minded alphabet soup universities OUGHT to and MUST change to a two semester sport system, is now more crucial and extremely important for our sport to flourish for our student athletes. The present one fall sport of soccer is just simply NOT ENOUGH, and the governing bodies have to wake up, smell the coffee and the roses or else we'll see more and more young athletes do as illustrated above and the /our player quality will not flourish but is in danger of stagnating. Moreover, Scott had the necessary resources, more importantly a supporting family, and quite frankly a very comfortable life unlike those coming from - inner and outer citiy areas, unaffiliated leagues, etc. Don't get me wrong, Scott, chose his lot in life, and the story is well written, still, how many similar cases are there throughout this vast continent of ours, versus those who cannot even afford the pay-for-play leagues? All the best to Scott, do us p[roud "over there!" frank schoon, February 5, 2018 at 10:01 a.m.
Just great for him. Let him get the experience.